GBPUSD breaks to session highs. Above 100 day MA. 19:03/ Январь 14 /2019 год	Forex NewsОставить комментарий на GBPUSD breaks to session highs. Above 100 day MA. The GBPUSD has moved above the 100 day MA on the report that the ERG group of lawmakers will vote for PM May’s Brexit plan tomorrow. The 100 day MA comes in at 1.28921. The price has spiked up to 1.2930 The next target on the topside comes in at 1.2975 where the 61.8% of the move down from Septembers high is found. 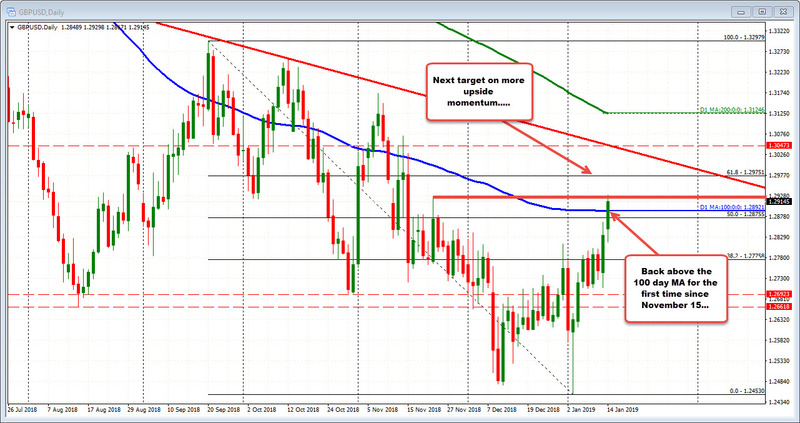 EUR/USD sellers get their much awaited break, but now can they follow through?